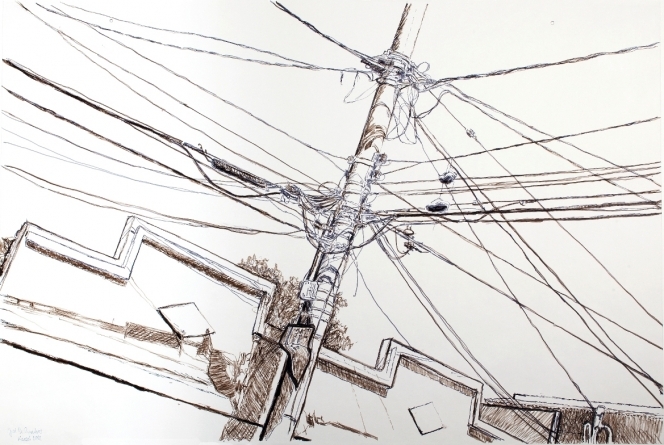 For years, the scenario of conductors of electricity and even high voltage passing snugly against the houses on the east side of São Paulo, in particular Itaim Paulista, always caught the artists attention. José De Quadros began to face them as a metaphor for this issue of social tension that permeates the city. Since electricity has the same circulating system, it will be used by various social strata. Aesthetically this chaos fascinated him and he decided to work with this idea, this chaos and fascination that exist constantly in Itaim Paulista, as well as on the periphery of major urban centers worldwide. José De Quadros, born 1958 in Barretos, Brazil, lives and works in São Paulo, Brazil and Kassel, Germany.